The Loyal Order of Ancient Shepherds was founded in Ashton under Lyne, near Manchester, in 1826. One of many 'friendly societies' founded in the early 19th century, it was concerned with the welfare and support of shepherds and their families, particularly in cases of sickness or death. As with most such bodies, the Order had an underlying Biblical and moral code, emphasising pastoral values and mutuality. While on official business members carried crooks and wore woollen cloaks, usually with a black-and-white check pattern, which were fastened with an official brooch. The society grew very quickly throughout Britain, but particularly in Scotland. 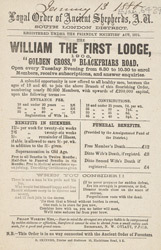 By 1910, the Edinburgh district had at least 39 lodges, with 6,000 full members and 2,000 juvenile members. This membership declined somewhat as the 20th century progressed and modern trade unions were established, but the society survives under the name of the Shepherds' Friendly Society.